Hipster Brewfus: Brewfus Chili Cook-Off! Ok, it's not REALLY a cook-off, but I needed an exciting title! My beef stew post garnered quite the positive reaction on Twitter, especially from one of my favorite people I follow, Katie, over at Simple Songbird. Is there a better compliment? It also helps that my fiancee thought it was delicious! Those two factors were enough for me to decide that I might be onto something with the beer and food related posts. Today's post is a recipe that hasn't let me down in the (only) 3 times I've made it. I get a lot of compliments, and I've had a lot of people ask me for the recipe. Truth is, I modify the recipe every time I make it. So what I'm going to do, is give you my basic recipe, and then I'll kind of cliff note it with how I changed it for this particular batch (which just might be the best one yet). The night I made it, I went and picked up one of the most important ingredients! 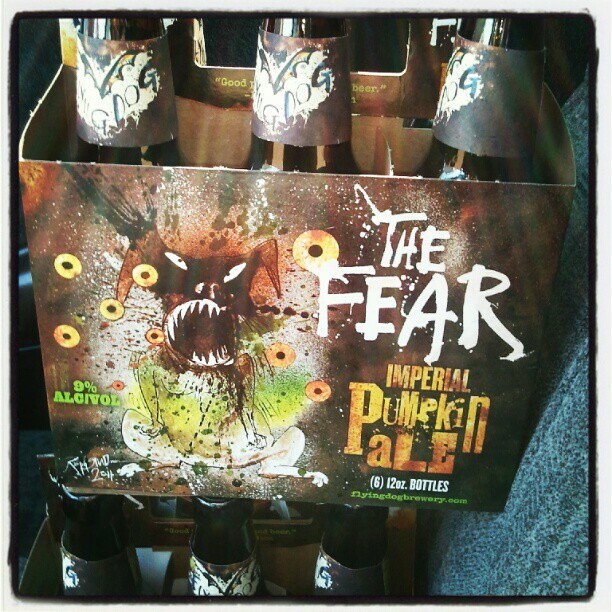 The excitement I have for this beer is being saved for another post! That is a lot of stuff! Here are some cliff notes! If you follow that recipe, you will find yourself enjoying a deliciously spicy chili, just the way most people enjoy it! But truth be told, some people just don't want an overly spicy chili. So this time around, I reduced some of the spice, so here's what I did differently. I reduced the chili powder, chipotle powder, hot sauce (sriracha), and cayenne pepper by 50%. That's it. And it seemed to have done the trick, as my normally too spicy chili, was absolutely loved by my fiancee. 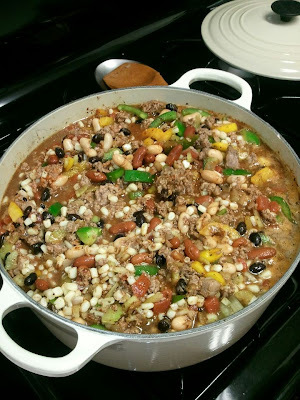 I also added one can of black beans, and one pound of frozen, white corn. Is that confusing at all? Let me know. The prep work takes a lot of time, chopping the veggies into delicious, bite size morsels. When you slice the onions, put them off to the side. I drain the beans and tomatoes ALMOST fully, leaving some of the juice in each, but not a huge amount. Id say drain 75% of each can. I like to pile all the chopped veggies (except the onions) and beans and tomato into one big bowl, and have a small dish with all your measured out spices ready to go. But hey, that's just me. 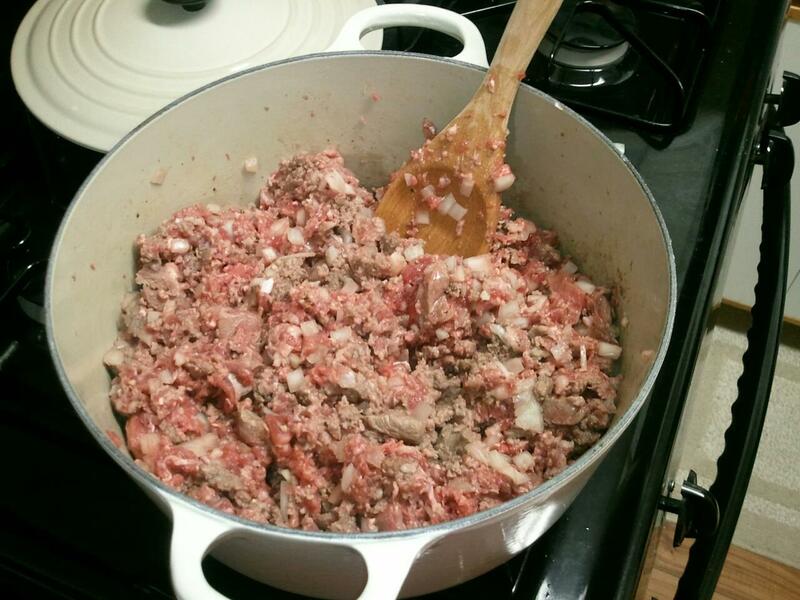 Start by browning all your meat together with the onions. Make sure you have a big size pot! This is a big recipe! I use my La Creuset 5.5 quart French Oven. I know, very fancy. So brown your meat and onions together in your pot. You can drain it, but I don't because I'm gross, and I think it adds to the flavor. 4 pounds of delicious meat! After this, add the rest of your beans, and veggies and spices and beer! 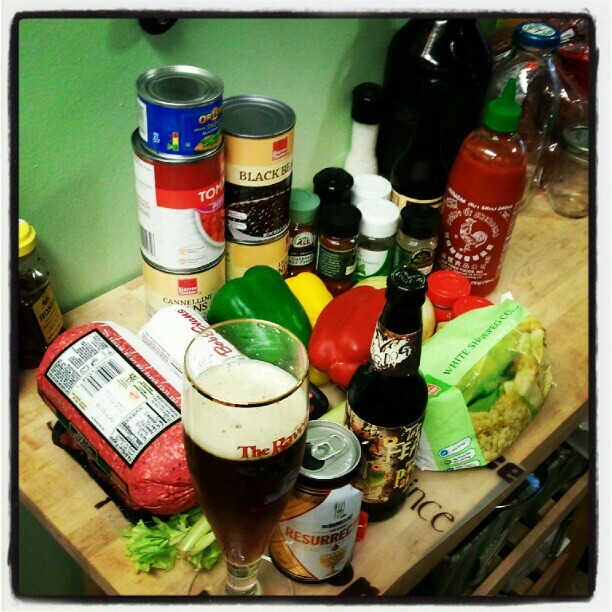 Now, like with beef stew, I like to cook chili with a dark beer. This time around, I used Flying Dog The Fear, after discussing with the fiancee, she told me pumpkin and beef work well together. Now that everything is on your pot, I bet your kitchen and rest of your house is starting awesome. But you're not quite done yet! Stirring it once in a while, cover it and let it simmer on your stove top for about 2 hours. Truth be told though, the longer it simmers, the better it's going to taste. The last half hour to 45 minutes though, I like to uncover it and let it continue to simmer so it starts to thicken. Throughout the duration, make sure to taste and season as you go along to fit your tastes! Like with any recipe, feel free to mess with it and make it your own if something seems unappealing. And if you make it, share it with me, let me know what you think! woot woot! so pumped that my encouragement meant that much to you!! :) if this is even half as good as your beef stew, I KNOW I'm gonna love it. I'll have to add it to my list of recipes to try! This appears to be a damn good foundation and beer always helps. I make a beer chili myself but I add choclate for complexity. Good job. That original recipe must have added hair to people's chest. Thanks! It is very solid in my eyes, but I still love tweaking it here and there. I love chili, there really isn't a "wrong" recipe! I like the chocolate idea though! Maybe I'll give that a shot! Do you add a bakers chocolate or a Hershey bar? And the original recipe is a nice, intense, slow, smoldering heat. Maybe when It gets a bit more frosty outside, I'll go down that route!